By Dan Ambrose: WBC light welterweight champion Erik Morales (52-7, 36 KO’s) a tiny reprieve by his gallbladder surgery that postponed his fight #1 World Boxing Council challenger Danny Garcia (22-0, 14 KO’s), but the fight has now been rescheduled for March 24th and Morales is still faced with the same tough task as he had before in trying to beat a younger, bigger, faster, stronger and taller Garcia. It just doesn’t look good for the 35-year-old Morales in this matchup. Morales has the experience but that stops counting when you get up age to the point where your body isn’t the same as it once was. Morales struggled in winning his last fight against little known Pablo Cesar Cano last September. Morales eventually wore the 22-year-old Cano down and stopped him in the 9th, but it was very tough fight for Morales when it should have been an easy one. Cano was a decent but not nearly in the same class as Garcia. There’s big difference between them. Morales just looks like a guy that’s fighting out of his weight class right now. His hand speed is slow and he doesn’t move like he used to. The WBC clearly did him a big favor in ranking him so highly and it was dumb luck for Morales when Lucas Matthysse, who he was supposed to fight last September, came up sick the week before the fight. Few people saw Morales winning that fight, and instead of taking a pounding against Matthysse, Morales got to face the inexperienced and badly flawed Cano for the vacant WBC title. The Morales-Garcia fight will be televised on HBO with the co-main event being James Kirkland vs. Carlos Molina. It’s a decent card right now but it needs at least one more good fight for the card to be a really good one. 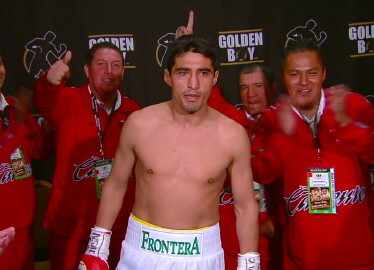 Watching an old Morales face a young guy like the 23-year-old Garcia isn’t enough on its own to bring in big ratings. Morales has been out of the sport too long and he needs a younger fighter on the card that connects with younger boxing fans.